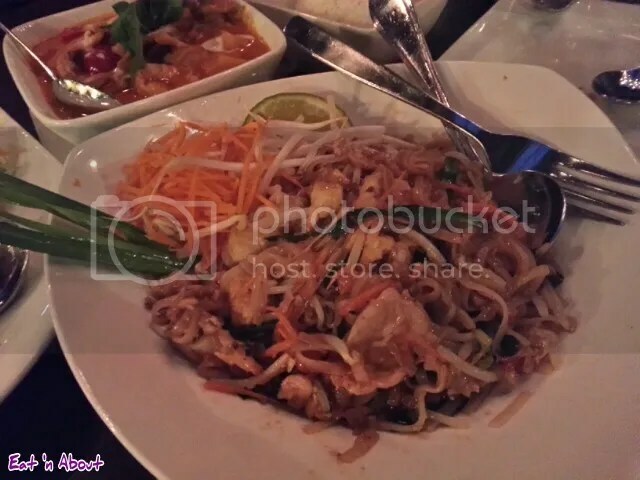 Wendy decided to take advantage of the Living Social voucher this evening so that I could try U & I Thai for myself. 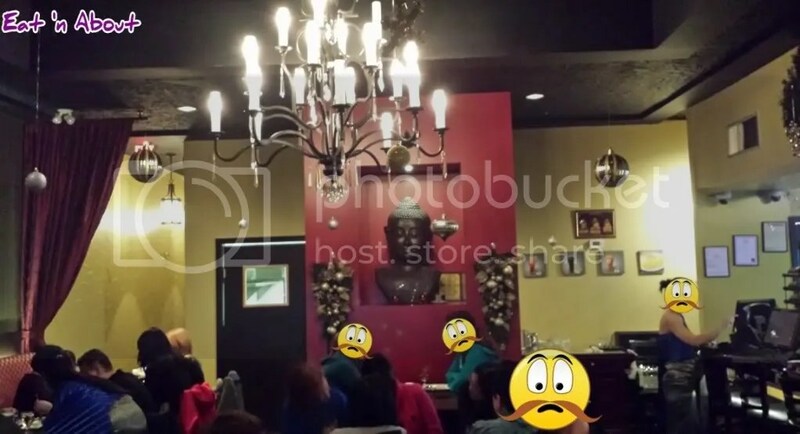 It was busy when we arrived but luckily Wendy had made reservations and we were seated immediately. They had the place done up nicely for Christmas with ornaments and wreaths etc. 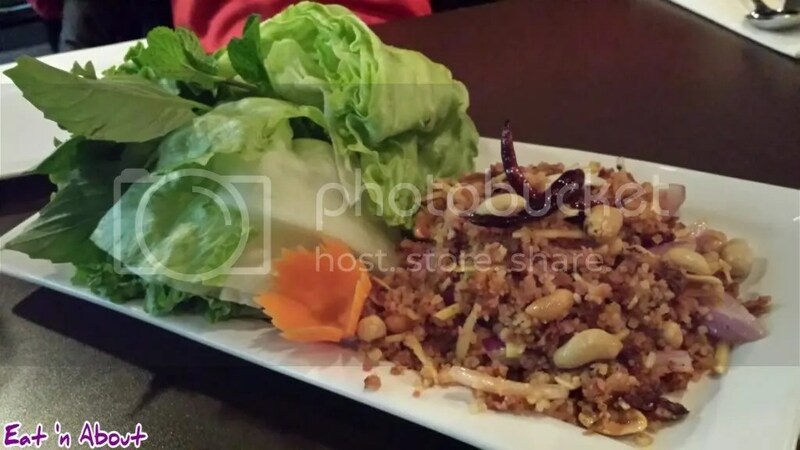 We started with Isaan Lettuce Wraps (Yom Nam Khao Tod) ($10.95). They throw everything but the kitchen sink into this one: pork, fried rice balls, egg, curry paste, ginger, cilantro, red peppers, onion and toasted peanuts. The menu says it’s served with sweet basil sauce but they gave us fresh basil instead (not that I’m complaining, the basil was fresh and tasted great in the wraps). It also came with both iceberg and green leaf lettuce, which was nice. It was also nice that there was more than enough lettuce to go around since we’ve run out before the filling is done at other places. This dish reminded me of the yam naam we had at Maenam a while back but the flavours were more balanced so the salty and sour aspects didn’t overpower the sweet and spicy. We both thoroughly enjoyed it. I’m shamelessly jacking this pic of their Authentic Pad Thai (Gai) ($12.95) from Wendy’s first visit since I neglected to take one, but ours looked the same except with more chili peppers (I ordered it spicy) and no carrots. I was really impressed with this one. They added lots of kick with the chilies and the chicken was plentiful. The green things sticking out are garlic chives which is a cool addition and they get bonus points for the tamarind sauce too. I would say this is in the top 3 Pad Thais I’ve had around the Lower Mainland. Now for the big miss of the night. 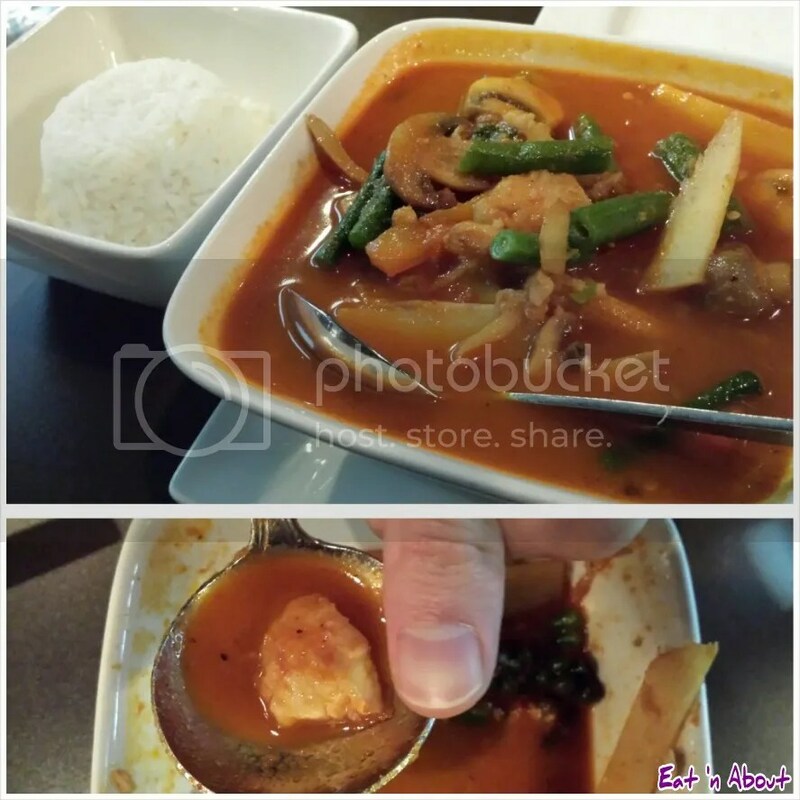 We ordered Fish Jungle Curry (Gang Pah) ($14.95). Our first gripe is that we ordered it medium spice level, and the waitress repeated our order back to us and listed it as a medium spice level. But when we dug into it the curry turned out to be EXTREMELY spicy, far more spicy than our “spicy” Pad Thai, so much so that we were dripping with sweat and Wendy ended up with heartburn later on. Now the menu lists it as being in a “spicy country-style curry broth” so maybe they can’t adjust the spice level but if that’s the case someone should have told us it wouldn’t be medium. The next big gripe is we only got 5 thumb-tip size pieces of fish in the entire bowl and the rest was veggies. If we wanted a vegetable curry we would have ordered off the vegetarian menu! I don’t know if this is part of their authenticity–i.e. if we were living in relative poverty in the jungle this is how much meat we would be served–but we weren’t too happy with the quantities, especially for $15. This seems to be a theme here since Wendy’s Duck/Lychee curry from her last visit had a similar problem. They also really cheaped out on the rice. I don’t know if they slimmed the portions down during the LivingSocial deal or if it’s because we ordered coconut rice instead of jasmine this time (they give you a choice and the first bowl’s complimentary, which is nice) but you can see from comparing this pic with the one in Wendy’s review that the portion has shrunk. You will definitely need at least two orders to get through your curry dish and refills are $2.50 a bowl (which is really just a few spoonfuls). So there you have it; some hits, some misses. I left feeling ripped off by the curry dish but the first half of the meal was really amazing.